Lakitu's Revenge (or World 5-1) is the first level of World 5 and the seventeenth level overall in Super Mario Run. The level begins with several Fuzzies in the foreground, as well as a Lakitu. After a ? Block with a Super Star, the first Pink Coin is up ahead, and can be collected by a single jump. Afterwards, a ? Block with a Super Mushroom appears, with a trampoline appearing not too long after, which the player must bounce on. Another ? Block with a Super Star appears, along with a drop leading to the second Pink Coin. Soon, the player will reach many lifts on circular tracks, with the third Pink Coin accessible from one of the center lifts near the end. Another Super Star will appear in a ? Block not too long afterwards, as well as another trampoline that, when bounced on, leads directly to the fourth Pink Coin. After another drop from another high-up mushroom platform, yet another ? 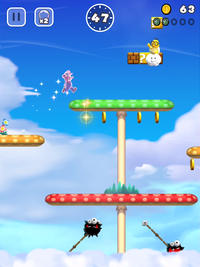 Block with a Super Star appears, and the player must jump on the consecutive mushroom platforms to reach the fifth and final Pink Coin. After a few drops, the player will reach one final trampoline leading to the Goal Pole. The level begins with several Fuzzies in the foreground, as well as a Lakitu. After a ? Block with a Super Star, the first Purple Coin is up ahead, orbited by a Fuzzy. Afterwards, a ? Block with a Super Mushroom appears, with a trampoline appearing not too long after, which the player must pass. The second Purple Coin is immediately, and the player must either use their remaining invincibility to defeat two Fuzzies and collect the coin or bounce on the second trampoline that appears to collect it. Soon, the player will reach many lifts on circular tracks, with the third Purple Coin accessible from one of the bottom lifts near the end. Another Super Star will appear in a ? Block not too long afterwards, as well as another trampoline that, when bounced on, leads indirectly to the fourth Purple Coin; the player must collect said coin while they still have their remaining invincibility. After another drop from another high-up mushroom platform, yet another ? Block with a Super Star appears, and the player must keep low to collect the fifth and final Purple Coin, of which a Fuzzy is orbiting. After a few drops, the player will reach one final trampoline leading to the Goal Pole. The level begins with several Fuzzies in the foreground, as well as a Lakitu. After a ? Block with a Super Star, the player must drop down and bounce on a trampoline to get the first Black Coin. It leads to a ? Block with a Super Mushroom, with a trampoline appearing not too long after, which the player must pass and bounce on the next trampoline in order to get the second Black Coin. Several mushroom platforms appear afterwards, along with many lifts on circular tracks, with the third Black Coin appearing in the center of the area, orbited by two Fuzzies. The player must then jump on some high-up mushroom platforms, then onto a row of Brick Blocks, then jump far out, following the middle trail of coins, to another mushroom platform, then jump again to get the fourth Black Coin. After a while, the player must again follow a set of high-up mushroom platforms and Brick Blocks to the fifth and final Black Coin. After a few drops, the player will reach one final trampoline leading to the Goal Pole. This page was last edited on December 13, 2018, at 01:52.